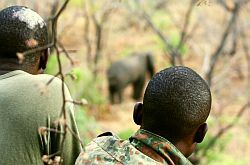 The Wildlife Action Group, founded in 1994, is a non-governmental, non-profit organization, working in nature conservation and management in the Central Region of Malawi. Its main objectives are to protect Malawi's wildlife and environment, and to assist and support the Malawi Government in the protection of National Parks, game and forest reserves. W.A.G. 's first main project is the Thuma Forest Reserve Eco-system Rehabilitation Project which started in 1996. With its straight forward approach of conservation, W.A.G. has managed to turn this once heavily poached reserve into a safe haven for wildlife in the region, with current elephant densities only second after Liwonde N.P.. W.A.G. 's second main project is the Dedza-Salima Forest Reserve Eco-system Rehabilitation Project which started in 2007. Through this project W.A.G. is determined to achieve the same positive conservation results in Dedza-Salima F.R. as has been achieved in Thuma F.R.. 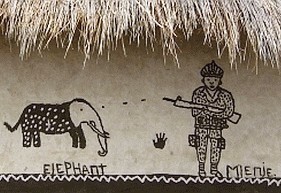 The most immediate threat to most elephant populations in Malawi is illegal hunting for ivory. And WAG is working very closely with DNPW and other government agencies to bring about the effective enforcement of these laws. This activity will not only curtail the operations of those illegal forest/ wildlife exploiters who are prosecuted, but as awareness spreads it will act as a deterrent and reduce the overall level of illegal hunting and trade. However uncontrolled illegal activities in the two reserves (mainly poaching, charcoal burning and illegal harvesting of bamboo and timber) threatened to destroy its precious habitats and the environmental services it provide for the region and the nation which is why our scout work and presence is so important. Most NGO's working in conservation receives funding for starting micro-projects in villages, for putting up an electric fence to keep elephants out of the fields of farmers, for putting up direction signs, for buying GPS's for mapping natural forest resources, for conservation awareness projects and so on. Most people acknowledge that these activities are extremely important in conservation, and so do we, at the same time often hardly any funding is made available for paying the staff, whom are crucial for actually doing all this work. And even more important, and where it all starts with, the primary task of scouts and other field staff is to protect and to secure the wildlife in the reserve; micro-projects and direction signs are of course utterly useless, when at the same time, the wildlife in a reserve is poached to extinction because of the lack of field staff. Malawi, the friendly heart of Africa, its people and its wildlife need and deserve the dedication of all who can make that positive difference!